This is one dip you will want to make sure you have an abundance of items to dip into it. My favorites are potato chips, cassava chips, celery, carrots, peppers, cucumbers and my fingers. This is great to also serve as a garnish for chicken or pork and is great as a spread for a wrap. My favorite however is to eat it watching the Super Bowl game next month. Today I’m also going to update this recipe to keep it soy free too. I do this by using Cashew Cream instead of the soy cream cheese and sour cream. It works perfect and still highly addictive. Cut your onions in half and then into thin slices. A V-slicer or mandoline is great for this but if you don’t have those make sure your knife is very sharp. Heat your pan on medium high. Heat up the oil and butter until it starts to ripple. Add in your onions and toss them around so they all separate and are coated with the oils. I like to use tongs to do this instead of a spoon or spatula. It gives me more control over the onions. Keep an eye on them and as they start to brown mix them up so every onion has it’s chance to brown on the bottom of your pan. You’ll want them to brown deeply but not burn. Once they start to brown you can turn the heat level down so they continue to brown. If you are using a non-stick pan instead of stainless it will not work as good, but it can still be done. This whole process can take 15-30 minutes depending on your pan and how many onions you have. Once you are happy with how brown they are, add in the chicken stock and reduce the liquid so it’s almost all gone. Once this is done remove your onions and let them cool to room temperature. In your food processor mix the two cheeses and the garlic powder. Scrape this out into a mixing bowl. Once the onions have cooled add them to the processor and chop them. You decide how small you want the onions to be. I don’t like big pieces of onion in my dip but you might. 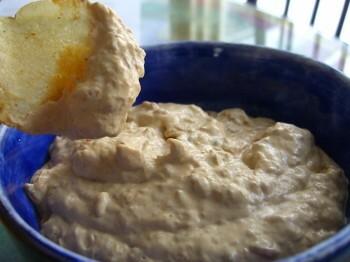 If using cashew cream cheese instead mix in the chopped onions and garlic powder in a bowl. Once these are processed add them to the cheese mixture and combine well. Give it a taste test and see if you want to add in any salt and pepper. Be warned, that taste testing can be dangerous to your waistline if you taste the whole bowl. This makes a good size bowl of dip. Once your party is over, what can you do with the leftovers besides just dipping? It makes an amazing sauce for your Swedish meatballs and noodles, a topping for a grilled chicken breast and a great addition to your brown gravy. You can always substitute regular dairy for those who eat it. * To keep this vegetarian use vegetable stock in place of the chicken stock. Soak the cashews in water for 3 hours. If you are short on time you can use hot water and soak for 20 minutes to 1 hour. Drain the water and add cashews, lemon juice, salt and water to very fast blender like a VitaMix (affiliate link). Start off slow and increase in speed as the cashews begin to break down. Add in more water if needed. Blend until creamy. This took me 10 minutes going slow until the very end where I put the Vitamix on high. Let this cashew cream set up in the refrigerator for at least an hour and up to a couple of days. Do you know if you can make cashew cream cheese in a blender or food processor? The recipe looks good but I don't eat soy and don't have a vitamix or other high speed blender. Thanks. Shannon you can make it in a really good blender and probably a food processor but it will take longer and I'm not sure if it will be as creamy. I would suggest you soak the cashews a little longer. Let me know how it turns out. I'll give it a try and let you know. This should be something fun to share at my next get together. I am so psyched about using cashews to make cream with. It's just so amazing! And it works! Thank you for sharing, especially the part about dipping your fingers into the dip:). You always have your finger with you. Can't wait to hear what else you're making for the big game. It would be really fun to see Tebow in the big game! How many oz. of cashews are you starting with to make the combined 12 oz. of cashew cream? As you can tell I have never made cashew cream before but it sounds wonderful. I usually use 2 cups of cashews but you really just need to play with the recipe so it's to your taste. Remember you can always add in more lemon and water to the cream. OH, that looks like a tasty indulgence. I could use that right now, I have LOADS of crackers to use up! Alisa I'm going to make this one again for the game. It's just too good.